I decided to abandon the Halloween outfit idea, because my enthusiasm for it was waning only half-way through the first try. 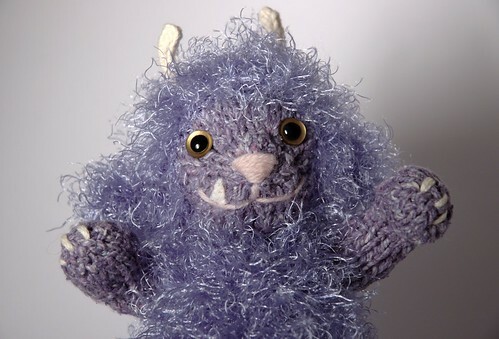 I was far too in love with the monster I had been knitting, so I finished that instead. 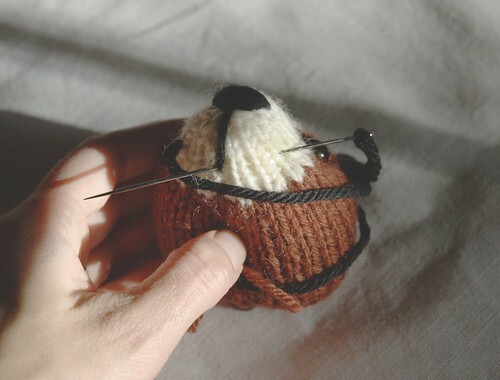 I don't have the time to publish it as a new pattern (besides, I've put out a lot of new ones lately), so I'm going to give you some basic directions on how to make your own Fuzzy Monster! This is a project that can only be improved by applying your own creativity, so read what I did, then go wild! 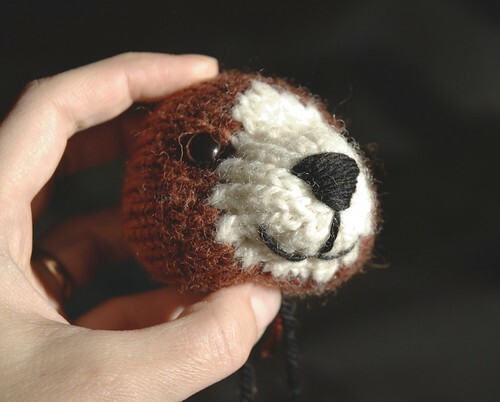 First, download the Fuzzy Lamb pattern if you don't already have it (Ravelry, or direct). Work the arms and legs in the smooth yarn. You can vary the length by adding or subtracting rows after row 14. 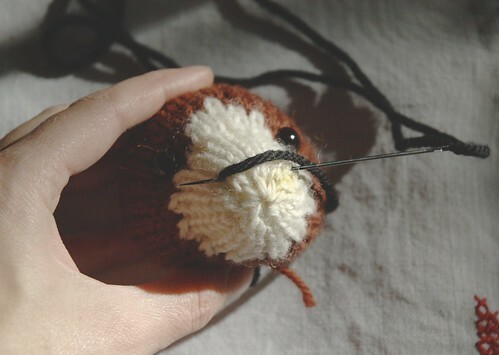 Work the body and ears in the fuzzy yarn. 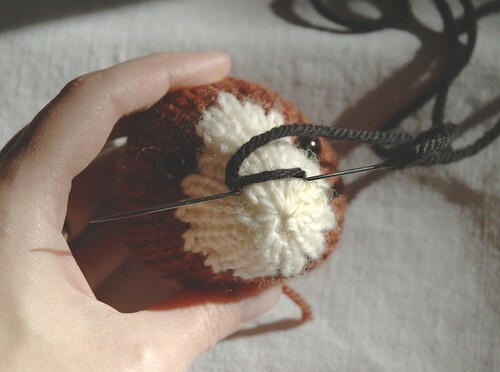 For the head, use the fuzzy yarn for the main colour, and the smooth yarn for the contrasting colour. 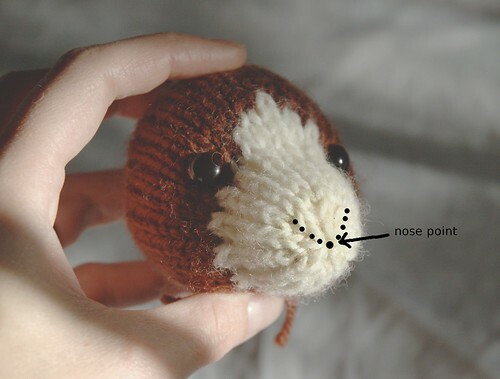 Once the head is done (eyes on, nose & mouth embroidered), cut teeth from the white felt and sew onto the face (or embroider them if you don't have felt). Assemble the rest of the toy. Embroider claws on hands and feet. For the horns, on the dpns knit 2 short lengths of 4 stitch I-cord with the white yarn. I made mine 7 rows long before casting off. 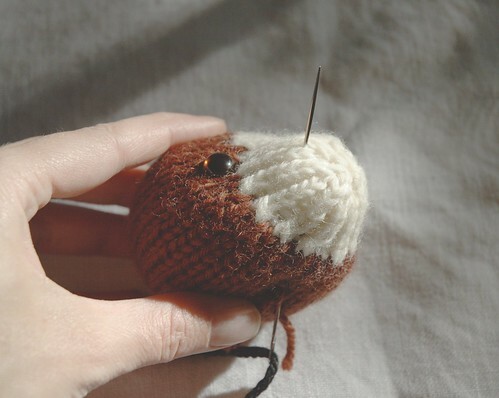 Sew the cast-off edge of the horns to the head, and secure the yarn ends. 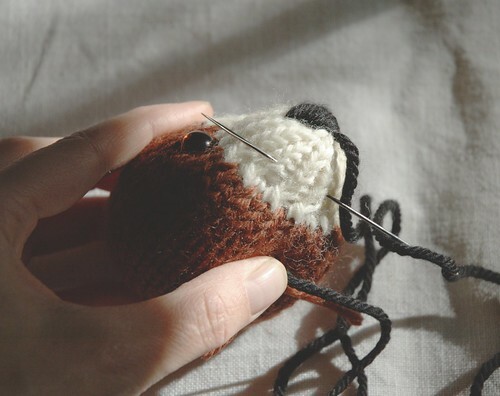 If you don't know how to knit I-cord, try crocheting some horns. Finally, head your monster in the direction of the nearest small village which requires terrorizing! P.S. 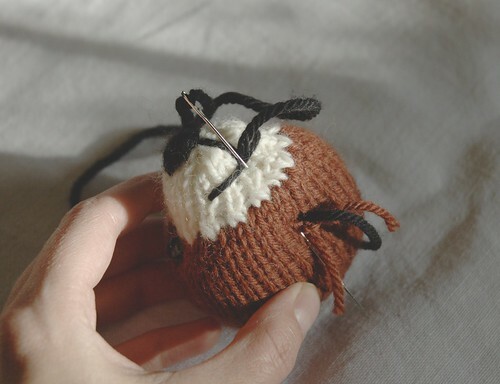 If you're short on knitting time, just whip up some mini aliens to pop into the treat bags of special little ones. 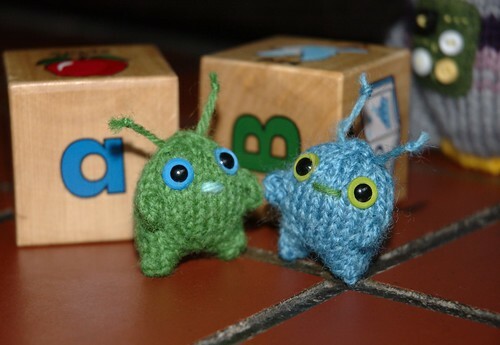 Pour toutes et tous parmi vous qui sont francophones, la version française de "Mini Alien" est maintenant disponible sur le blogue de Knit Spirit. Merci beaucoup pour la traduction, c'est très gentil. :) En effet, son blogue est plein de tout sorte d'excellent contenu sur le sujet de tricotage qui est certain d'attirer votre attention -- ne le passez pas à côté! Wow! I had no idea the Owl Tuque would be so popular. I can't wait to write that nice cheque for the Ecomuseum. I hope to see more of your projects soon. It should be interesting to see what yarns you use, and how they turn out. This might be a good project for odd skeins of hand-spun too. I wish I had more interesting news and photos to share with you. 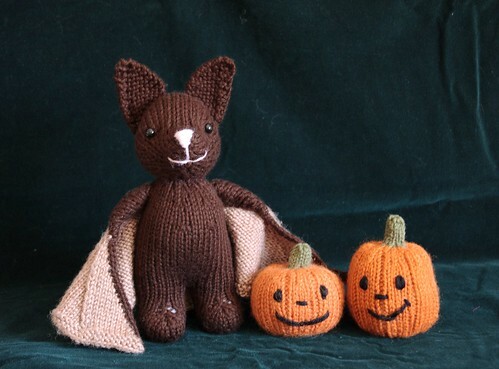 I've been doing a lot of Autumn-related stuff: transplanting perennials and doing a bit of garden clean-up, putting up batches of different preserves, going for long walks on the rare nice days, suffering through our first colds of the season, and trying to work up some fun Halloween toy ideas for you. 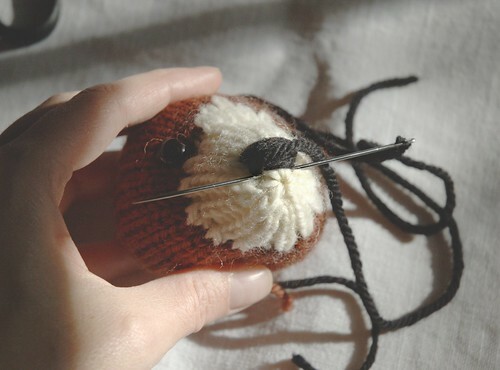 Unfortunately for that last one, my knitting time has been pretty scarce the last several weeks. 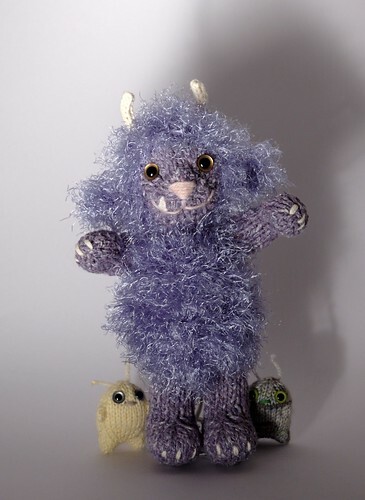 One project I had going was a cute and furry monster made from the Fuzzy Lamb pattern. I really don't see how I will find time to finish it, though. The basic idea was to use crazy/colourful eyelash or other furry yarn for the main colour, and a smooth coordinating yarn for the contrasting colour. Then I was going to add little I-cord horns, and maybe some pointy felt teeth. *sigh* It would have been so awesome. Feel free to use any of these ideas and let me know, so I can share your finished monsters here! The other Halloween idea I had was a costume, but the yarn for it only arrived today. If I use my evening knitting time (usually reserved for socks) I should be able to get it done by this weekend. If I don't get it done in time for the holiday, I'll share it anyway because I'm pretty sure some of you will like it.